Reference number for this case: 7-Oct-54-Morsbach. Thank you for including this reference number in any correspondence with me regarding this case. REIMS (from our correspondent). -- It was a mechanic from the Panhard factory in Reims, Mr. Joseph Roy, 30, who would have had the advantage of seeing a machine a few meters from the road from Reims to Rethel, on a side road. In the night from Tuesday to Wednesday, as he rode on a motorcycle, he suddenly saw a bright, reddish gleam before him, which suddenly disappeared. Arrived at the spot where he had seen this gleam, he noticed in the fields a strange object, 3 meters long, in the shape of a large shell pierced with portholes at the front. He distinguished, on the other hand, a vague silhouette. But frightened, he fled. Three other workers had seen the same light in the same place. FORBACH (From our correspondant) . -- Thursday evening, AT ABOUT 07:20 P.M., while returning from his round of distribution, the driver of the Coca-Cola company, Mr. Bou Charles, aged 30, resident of Stiring-Wendel, 21 rue Nationale, was after the crossing of Rosbruck on the National Road N.3, at the entry of Morsbach when suddenly, his attention was caught by a machine being on this road. Mr. Bou, astonished, believed in a road accident and stopped his truck within a few meters of the machine. At this point in time he realized, while getting out of his vehicle, that it was a circular machine of a diameter of 9 m and a 4 m height approximately (more than 2 times size of a normal man), which was lit by several beams of lights directed towards the ground. Ahving approached and being within a few meters of this odd apparatus, Mr. Bou saw the machine suddenly taking off vertically and rising at 10 meters approximately in the air, to then move in the direction of Morsbach. All this scene occurred in the timeframe of a few seconds in front of the amazed driver. Mr. Bou, still under the blow of the emotion, took again his road and went to his owner, to whom he described the scene, and went to refer about it to the gendarmerie. Captain Bohler, informed, went with Mr. Bou on the location, but could not detect any trace on the roadway. He lengthily questioned the driver, who declared to him that the saucer had the shape of a giant plate, of blue color. He did not see an opening nor any occupant. The machine, while taking off, did not make any noise, no air volume was displaced and there was no change of color. At the time of the appearance it rained, and Mr. Bou declares that when the apparatus rose and disappeared it had an excessive speed, which cannot even be compared to that of a jet airplane. The most astonishing of the case is that Mr. Bou, visiting a customer a few moments before, in Merlebach, declared to this one that he does not believe in these flying saucers stories. He was thus all the more frightened when seeing this machine. The driver that we saw during his interrogation by Captain Bohler, appears to be of good faith and was still under the blow of a visible emotion yesterday morning. On October 6, 1954 at 07:20 p,m, on the road RN 3 between Rosbruck and Morsback in the Moselle, Charles Bou, aged 30 years, driver for the Coca-Cola company of Forbach, living in Stiring-Wendel, returned by truck from a round of deliveries, under the rain, when his attention was suddenly drawn by a craft being on the road. Mr. Bou was astonished, thought of an accident and stopped his vehicle within a few meters of the object. While getting out of his truck, he twice saw that it was a lenticular craft of a diameter of nine meters and four meters height approximately, more than twice the size of a normal man, which was lit by several beams of light directed towards the ground. The machine was in the shape of a giant plate of blue color, did not change color, had no opening, and no occupants were seen. He approached within a few meters of the object, and then saw it rising suddenly to approximately ten meters height, and then to propel itself towards Morsbach. The sighting lasted a few seconds, there had been no noise on the ground nor at the time of takeoff. The craft's speed was so fast "that it is not even comparable to that of a jet plane." Mr. Bou resumed his travel, very moved and, arrived at the hangars of his employer, told of the incident to his boss who directed him to the gendarmerie of Forbach. Captain Bohler captain went on the premises with Mr. Bou, but no trace could be found on the roadway. The witness did not believe in the flying saucers before this experience and appeared sincere to the journalist who interviewed him. Jean Sider, decades later, in 1989, tried to obtain the documents or reports from the gendarmerie relating to this case. When he asked first for documents relating to falls of satellite, they were denied to him by the French government with the reason that the secrecy can be lift off only after 30 years. For this flying saucer case, the documents were also denied to him by the French government under the terms of the rules on the military secrecy, which, with regard to UFOs, make the documents secret for 60 years, with no exception. Jerome Beau indicates that "Interested by this case, Jean Sider would write in 1989 to the Ministry for Defense as at the General Management of the National Gendarmerie who would answer to him that the file is classified for 60 years." Jérôme Beau reproduces the [ll1] source and indicates that in 1989, "Jean Sider writes to the Ministry for Defense as well as to the General Management of the National Gendarmerie who would answer to him that the file is classified for 60 years." Luc Chastan indicates that in the Moselle in Morsbach on October 7, 1954, at 19:20 hours, "Coming back from his distribution round , the driver of a soda company, was, after the crossing of Rosbruck on the National Road N.3, at the entry of Morsbach when suddenly, his attention was drawn by an apparatus being on this road. The witness, astonished, believed in a road accident and stopped his truck at a few meters of the craft. At this point he realized, while getting out of his vehicle, that it was a circular apparatus of a diameter of 9 m and a 4 m height approximately (more than 2 times the size of a normal man), which were lit by several beams of lights directed towards the ground. Having approached and being at a few meters of this weird craft, the witness saw the machine suddenly taking off vertically and rising to 10 m approximately in the air, to be propelled then in the direction of Morsbach. All this scene occurred in the time of a few seconds in front of the confused driver. The latter, still under the shock of the emotion, ersumed his travel and went to his boss, to whom he described the display, and went to report about it to the gendarmerie. Captain Bohler, informed, went on the spot with the witness, but was unable to detect any trace on the roadway. He lengthily questioned the driver, who declared to him that the object had the shape of a giant plate, of blue color. He did not see an opening nor an occupant. The machine while taking off, did not make any noise, No air volume displacement and not change of color. At the time of the appearance it rained and the witness states that when the apparatus rose and disappeared it had an excessive speed not being comparable even to a jet plane. The driver remained a few days under the shock of a visible emotion." Luc Chastan indicates that in the Moselle in Rosbruck on October 6, 1954 at 19:20 hours, "a driver deliveryman discovers an object on the road between Rosbruck and Morsbach. Thinking of an accident he stops at a few meters of the object. He gets out of his truck and observes whereas the object is lenticular of a diameter of 9 meters and a height of 4 approximately. Several beams of light are directed towards the ground. Approaching the object, the latter then rises at ten meters in height and goes away towards Morsbach. The witness specified to the gendarmes that the object was in the shape of a giant plate of blue color without opening, no noise on takeoff and very fast disappearance. Witness obviously moved following this vision." 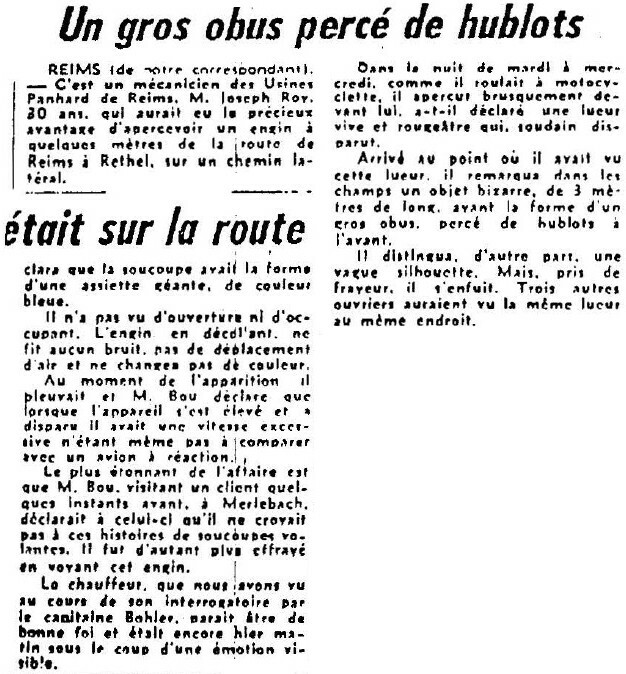 [ll1] Article in the regional newspaper Le Lorrain, Nancy, page 7, October 9, 1954. [ll2] Article in the regional newspaper Le Lorrain, France, October 11, 1954. [---] Article by Jean Sider in the ufology magazine Lumières Dans La Nuit (LDLN), France. [js1] "Le Dossier 1954 et l'Imposture Rationaliste", book by Jean Sider, Ramuel publisher, France, pp 97-98, 1997. [js2] "Ultra Top Secret - Ces OVNIS Qui Font Peur", book by Jean Sider, Axis Mundo publisher, pp 429-431, 1990. 0.1 Patrick Gross December 28, 2004 First published. 1.0 Patrick Gross May 6, 2009 Conversion from HTML to XHTML Strict. First formal version. Additions [jb1], [jb2], [lc1], [lc2]. 1.1 Patrick Gross January 23, 2017 Addition [ll2]. 1.2 Patrick Gross Fabruary 11, 2017 Additions [bl1].